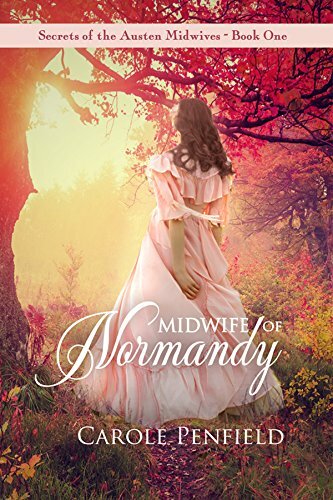 Carole Penfield gives readers a realistic and interesting piece of historical fiction in The Midwife of Normandy. The story opens with Clare, who finds herself in the cargo hold of a ship along with her family. It is the late 1600’s and they are sneaking out of France to England, where Protestants are not persecuted, and she can continue her midwifery practice. We have no idea what preceded her current state of affairs until we are transported back to her youth and the very first day she received her journal. We learn about Clare’s upbringing and the strong tradition of midwifery in her family, along with the history of disapproving husbands. It is not long before Clare herself is ready for training and eventually ready to take over the practice. It is also not long before she acquires a disapproving husband of her own. Penfield creates a beautiful and flowing story with elements of history, romance, and story-telling brought together by a colorful cast of characters. Clare is a strong female lead, dealing with issues that are timeless. I love that her family has such a passion for helping other women and will stop at nothing to do so. The history behind this story is interesting and lead me to further research, which is one thing I really love about pieces of historical fiction. I thought the author could have included more realistic dialogue to the times, but I understand that just wasn’t the direction she went with this piece. Her characters are fantastic and add richness to the story, as all good characters do. There are characters with a dark side and those who even it out with some comedy and levity. Penfield is a self-proclaimed lover of Jane Austen and weaves elements of that authors works into her story. She challenges other Austen fans to find little hidden tidbits throughout the story that are Austen-inspired. The juxtaposition of a personal story of feminine struggle for power and equality with the story of a religious group struggling with the same issue is an interesting one. These are themes that have manifested throughout history and continue to be real struggles so I thought this book felt modern despite its historical setting. Penfield did a beautiful job with this story. I was entertained and interested throughout and even learned new history! I look forward to reading more books in this series!